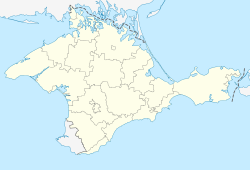 Location of Bakhchysarai on a map of Crimea. Located in a narrow valley of the Çürük Suv river, the first artifacts of human presence in the valley date from the Mesolithic period. Settlements existed in the valley since Late Antiquity. The founding of Bakhchisaray was preceded by the Qırq Yer fortress (modern Çufut Qale), Salaçıq, and Eski Yurt — these are incorporated into the urban area of modern Bakhchisaray. Bakhchysarai, first mentioned 1502, was established as the new khan's residence by the Crimean Khan Sahib I Giray in 1532. Since then, it was the capital of the Crimean Khanate and the center of political and cultural life of the Crimean Tatar people. After several wars with Russia from 1737 when Burkhard Christoph von Münnich burnt down the capital of the Khanate and the annexation of the Crimean Khanate by the Russian Empire in 1783, it was turned into an ordinary town, having lost administrative significance. However, it remained the cultural center of the Crimean Tatars, for example as the city where Ismail Gaspirali founded the newspaper Tercüman, until the Sürgün (deportation on 18 May 1944). Spellings of the town's name in different languages include: original Crimean Tatar: Bağçasaray, Turkish: Bahçesaray, Russian: Бахчисарай - Bakhchisaray, and Ukrainian: Бахчисарай - Bakhchysaray. The name comes from Persian باغچه سرای bāghche-sarāy which means the Garden Palace. In Crimean Tatar, bağça means "garden" and saray means "palace". Russian speakers associate the town with the Romantic connotations of Alexander Pushkin's poem The Fountain of Bakhchisaray (1822). Adam Mickiewicz dedicated some of the finest poems in his Crimean Sonnets (1825) to the landmarks of Bakhchisaray. An asteroid, 3242 Bakhchisaraj, discovered by Soviet astronomer Nikolai Stepanovich Chernykh in 1979, takes its name after the town. There is a network of well marked hiking trails around the town. All the main attractions are connected with red-marked trail. Since 2011 thanks to the support of the Czech Government and USAID the Tourist information centre has been working. In 1930 the population of the city was 10,450. The ethnic groups represented were 7,420 Crimean Tatars, 1,850 Russians, 315 Jews, 205 Greeks, 185 Ukrainians, 50 Germans, 30 Armenians, 30 Bulgarians, and 365 others. ^ "European Council Conclusions as of 20 March 2015" (PDF). Wikivoyage has a travel guide for Bakhchysarai. Wikimedia Commons has media related to Bakhchisaray. Wikisource has the text of the 1911 Encyclopædia Britannica article Bakhchi-sarai.